About 8.5 inches by 10.75 inches. 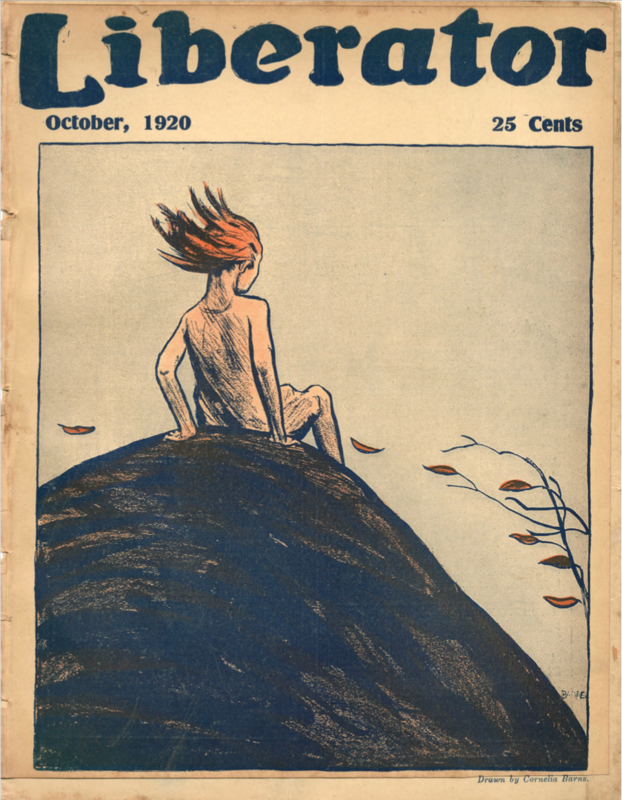 Cover design changes with each issue, featuring modern artwork in color. Black and white politically-themed illustrations found within the pages. Ranges from 35-55 pages of mostly social, political, and literary articles. Priced at 15-25 cents per issue. Max Eastman (predominantly) with Floyd Dell and later Robert Minor editing within the last few years of publication (after 1922). After the Espionage Act of 1917 ended publication of The Masses, Max and Crystal Eastman started The Liberator to further the political discourse of The Masses. Building upon the concepts of freedom and liberty outlined in William Lloyd Garrison’s abolitionist newspaper (“The Liberator”), the Eastmans intentionally published their first issue on February 12, 1918, the birthday of President Abraham Lincoln. The journal provided first rate news coverage of the civil war in Soviet Russia. Because The Liberator was the only source of news about the war, many European and American radicals looked to the magazine for information. In the first few volumes, war correspondent and Communist party founder John Reed provides an ongoing report of conditions in Soviet Russia. Most of the articles are political, promoting Socialism, workers rights, racial and gender equality, birth control, and progressive politics. Almost every issue begins with an editorial page in which Max Eastman provides commentary on where the journal stands in relation to current political and social events. The magazine included art, poetry, one-act plays, and fiction pieces, but almost always ones with political themes. Artwork, mainly in the form of political cartoons or illustrations, augments certain articles but is rarely the main theme of the literature. Advertisements are found sparingly at the end of the issue and usually publicize books, other magazines, or other Socialist education materials. Before the advertisements at the end, each issue devotes several pages to long reviews of books that can be ordered from “The Liberator Book Shelf,” a book store run by the magazine. The Liberator sought to educate and inform its readers about the events of World War I and the social and political changes occurring in America and abroad as a result of the war. Promoting progressive ideas about civil and economic liberty, the journal encouraged ways of rethinking democracy. Though it focused heavily on political and social issues, The Liberator also provided a forum for experimental freedom in art, poetry, fiction, and criticism. Published monthly for 15 cents per issue (later increased to 20 cents), the journal ran steadily from March 1918 to October 1924 until the Worker’s Party of America ceased it. The magazine merged with two other periodicals to form The Worker’s Monthly in 1924. “NEVER was the moment more auspicious to issue a great magazine of liberty. With the Russian people in the lead, the world is entering upon the experiment of industrial and real democracy. Inspired by Russia, the German people are muttering a revolt that will go farther than its dearest advocates among the Allies dream. The working people of France, of Italy, of England, too, are determined that the end of autocracy in Germany shall be the end of wage-slavery at home. America has extended her hand to the Russians. She will follow in their path. The world is in the rapids. The possibilities of change in this day are beyond all imagination. We must unite our hands and voices to make the end of this war the beginning of an age of freedom and happiness for mankind undreamed by those whose minds comprehend only political and military events. With this ideal THE LIBERATOR comes into being on Lincoln’s Birthday, February 12, 1918. THE LIBERATOR will be owned and published by its editors, who will be free in its pages to say what they truly think. It will fight in the struggle of labor. It will fight for the ownership and control of industry by the workers, and will present vivid and accurate news of the labor and socialist movements in all parts of the world. It will stand for the complete independence of women-political, social and economic-as an enrichment of the existence of mankind. It will join all wise men in trying to substitute for our rigid scholastic kind of education a system which has a vivid relation to life. It will assert the social and political equality of the black and white races, oppose every kind of racial discrimination, and conduct a remorse-less publicity campaign against lynch law. THE LIBERATOR will endorse the war aims outlined by the Russian people and ex-pounded by President Wilson a peace with-out forcible annexations, without punitive indemnities, with free development and self-determination for all peoples. Especially it will support the President in his demand for an international union, based upon free seas, free commerce and general disarmament, as the central principle upon which hang all hopes of permanent peace and friendship among nations. THE LIBERATOR will be distinguished by a complete freedom in art and poetry and fiction and criticism. It will be candid. It will be experimental. It will be hospitable to new thoughts and feelings. It will direct its attack against dogma and rigidity of mind upon what-ever side they are found,” THE EDITOR. Max Eastman, former editor of The Masses, was The Liberator‘s founding and primary editor for the first five years of the magazine’s publication. Leading a prolific career of intellectual and political activism, Eastman published over twenty books on subjects ranging from Socialism and Soviet culture to Philosophy and Religion. One of America’s most prominent spokesmen for the Bolshevik Revolution, Eastman promoted Marxism and Socialism for most of his life. Eastman’s writings dominate the first few volumes of The Liberator; he authored the editorial page and many of the journal’s political and literary articles and advertises his other literary works. In 1922 Eastman left the magazine to go to Soviet Russia “to find out whether what [he has] been saying is true” (qtd. in Diggins 23). After his trip to Soviet Russia, Eastman’s politics began to change and he later opposed socialism. Though he gave up his executive editorial position to pursue book writing, Eastman remained on the editorial staff of The Liberator until its end. Floyd Dell, founding associate editor of The Liberator, became an executive editor for a brief time after Eastman dropped down. As a teenager Dell joined the Socialist Party and began writing for Tri-City Workers’ Magazine, a Socialist monthly. Dell reported for the Davenport Times, wrote for the Chicago Evening Post, and edited the Post’s Friday Literary Review. In 1914 Dell moved to New York City and worked with Eastman to found The Masses. Dell played an integral role in establishing The Liberator by reading manuscripts, proofing articles, planning political cartoons, and recruiting more writers. Under Dell’s brief leadership in 1922, The Liberator favored art and culture instead of politics, publishing poems by Claude McKay and fiction by Michael Gold. Born in San Antonio, Texas, Minor became the highest paid cartoonist in the United States when he began working for New York World in 1911. Minor illustrated for the St. Louis Post-Dispatch (1904), the New York Call (1915), The Masses (1915) and The Liberator (1918). Drawn in crayon or ink, Minor’s cartoons undermined the effort of World War I and were often controversial. The United States government partly blamed Minor’s provocative cartoons within The Masses as reason for the magazine’s violation of the Espionage Act of 1917, which ended its publication. As a former Socialist, Minor joined the underground American Communist Party in 1920 after his visit to Soviet Russia. In 1923 Minor was elected to the Executive Committee of the Worker’s Party of America. When The Liberator’s finances ran dry in 1924, the Worker’s Party of America took over the magazine, turning it into The Workers Monthly. Under Minor’s editorial control The Liberator continued in similar format, but featured articles by prominent Communist leaders such as C.E. Ruthenberg and Max Bedacht. Baggins, Brian, Tim Davenport, and David Walters. “The Liberator Workers Monthly.” Marxists Internet Archive. USA History Archive, 2009. Web. 04 Sept. 2010. Diggins, John P. Up from Communism: Conservative Odyssesys in American Intellectual Development. Oxford: Oxford UP, 1994. Goodman, Martin H., ed. “The Liberator 1918 – 1924 Covers.” Marxists.org. 2014. Web. 13 Jun 2016. Liberator. Ed. Max Eastman. 1951. Microfilm. Vols 1-7. New York: New York Public Library. “Minor, Robert (1884 – 1952).” The Crystal Reference Encyclopedia. West Chiltington: Crystal Semantics, 2005. Credo Reference. Web. 07 October 2010. Simkin, John. “Floyd Dell : Biography.” Spartacus Educational – Home Page. 02 Oct. 2010. Web. 04 Oct. 2010. Watts, Theodore F. The Liberator Index: 1918 – 1924. Periodyssey Press: Easthampton, MA, 2011. Marxists.org. Web. 13 Jun 2016.